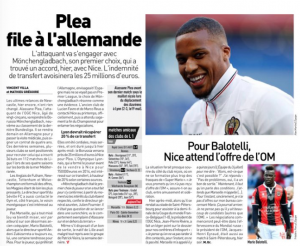 OGC Nice striker Alassane Plea has been attracting interest from England, Germany and Spain in the summer transfer window. According to French newspaper L’Equipe, the 25-year-old has been a target for Newcastle United, Tottenham Hotspur and two newly promoted Premier League clubs, Fulham and Wolverhampton Wanderers. All four clubs have made offers and Rafael Benitez’s side were ‘by far the most pressing’ club for Plea. Sevilla’s director of football also contacted Nice to see if they have any chance of signing the forward. Plea is aware of the offers from clubs across Europe, but the report claims he does not see himself playing in the Premier League, and Newcastle are going to lose out. Borussia Mönchengladbach have won the race to sign Plea this summer. The Frenchman will travel to Germany to undergo his medical tomorrow and sign a four-year contract with the Bundesliga outfit. Nice director general Julien Fournier confirms Mönchengladbach was Plea’s “first choice” club to join this summer. “Mönchengladbach was the first choice of the player and we did everything to comply, from the moment the interests of the club were respected. There was no question of getting into a bidding war, given Alassane’s exemplary behaviour on and off the pitch,” said Fournier. Newcastle’s efforts for the player have been repeatedly pushed, and again today by L’Equipe, so the club can’t be faulted for trying. But when a player prefers a different league there’s not a lot can be done.